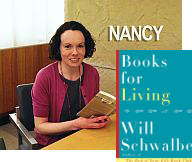 Will Schwalbe’s Books for Living is a celebration of reading and how worthwhile it is, even if you have a full plate of responsibilities. He thoughtfully explores more than twenty of his favorite books and what each has meant to him. This is a wonderful book for sparking your own thoughts on reading and discovering what you’ll want to read next.